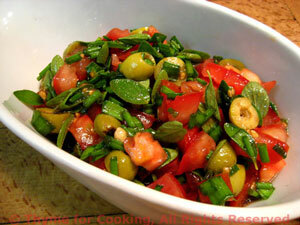 Tomato Olive and Fresh Herb Salsa, from Thyme for Cooking. This is just something I like to make and have on hand in the summer. I serve it with fish, shrimp, chops, pasta or, in this case polenta. It adds a bit of summer flavor. Use regular tomatoes or cherry, whichever has the best flavor. It keeps a few days in the fridge - more than three and the olives start losing flavor. Put oil, vinegar, chili powder and salt in small bowl, whisk to combine.